BALTIMORE, Md. — Police, schools, and community development are just a few of the items Baltimore City plans to spend its money on in the next fiscal year. One thing the city's $3.5 billion budget proposal for 2020 doesn't contain are budget cuts. The proposed budget breaks down into $2.9 billion in operating expenses and $634 million in capital investments. How Baltimore City should spend taxpayer dollars for the next fiscal year is the job of city budget director Robert Cenname. "We organized the budget around the mayor's five pillars. Her five pillars are public safety, education, quality of life, economic development and jobs, and accountability and transparency," Cenname said. Those pillars translate into dozens more revenue generating red light and speed cameras along with spending nearly $12 million in information technology and $5 million in emergency radio equipment upgrades for the police. Meanwhile, the conversion of 62 sworn officer positions to civilian positions as well as new BPD shift changes are expected to account for a potential savings. "We think the new patrol schedule will provide more consistent coverage in our neighborhoods, but it will allow us to reduce our overtime spending. We expect, we're budgeting for a reduction of $5 million in overtime spending in fiscal '20, based on that new schedule," Cenname said. 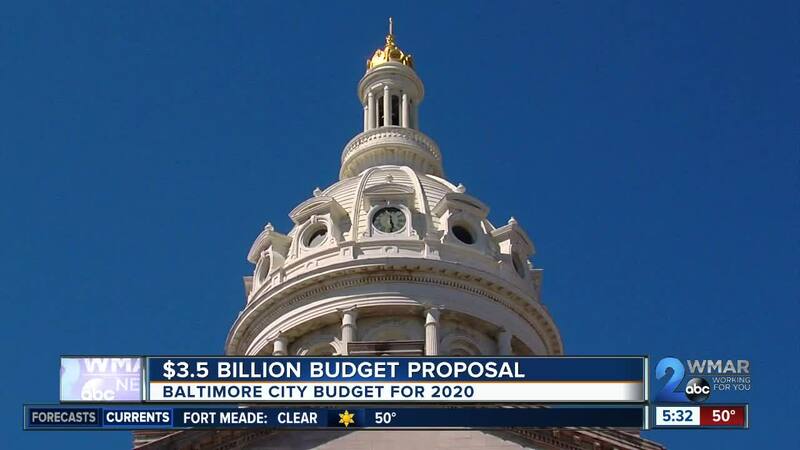 More than $530 million of the proposed 2020 budget is dedicated to the Baltimore Police Department, a $20 million increase over 2019. The budget proposal also includes $15 million for demolition and community revitalization, $500,000 to promote the Preakness to help keep the historic event in Baltimore, as well as millions for Baltimore City schools. "Our total investment this year is $375 million of support for the school system. That includes operating support, capital investment, and services that the city provides in and around the schools, such as school health services and crossing guards,"Cenname said. The $375 million education budget is about $3.7 million increase over 2019. It also includes a $38.5 million commitment to bridge the state-aid funding gap for city schools. Property taxes fund about 40 percent of the budget. Despite offering a 20-cent property tax rate reduction for homeowners, the proposed $3.5 billion budget doesn't call for any cuts in city services. Baltimore City Finance Department Director Henry Raymond said "revenue is in a good shape. We're able to provide all of our current level of services, and we're implementing some new initiatives that the city needs." "Our property assessments have grown now for six straight years in a row, and we also believe that our income tax base has strengthened over the last decade,"Cenname said. Concerned citizens can give the city their two cents on how it plans to spend their money at the Board of Estimates hearing on ' Taxpayer's Night ,' Tuesday, April 9.